Over at the Small Pond Science blog, Terry McGlynn has a thought provoking post which asks ‘Are trees the lawns of the future?‘. I won’t rehash Terry’s arguments, you can read it yourself, but I was intrigued by his stereotyping of lawns as always bad. As a keen amateur gardener and a professional with research students who have worked on garden biodiversity projects, I’d have to say that there’s lawns and there’s lawns: it all depends on how they are managed and what the purpose is of a particular lawn. Clearly there’s a continuum from high diversity, natural “lawns” (i.e. close-cropped grassland which can support significant biodiversity such as some chalk grassland and African savannah lawns) through to the high resource input, monoculture, perfectly presented lawns seen on golf courses and around important buildings. In the part of the continuum that Terry’s railing against, typical urban and suburban householder’s lawns and everything below that in terms of “naturalness”, it’s possible to manage lawns in a low-input way that is both productive and can support biodiversity. 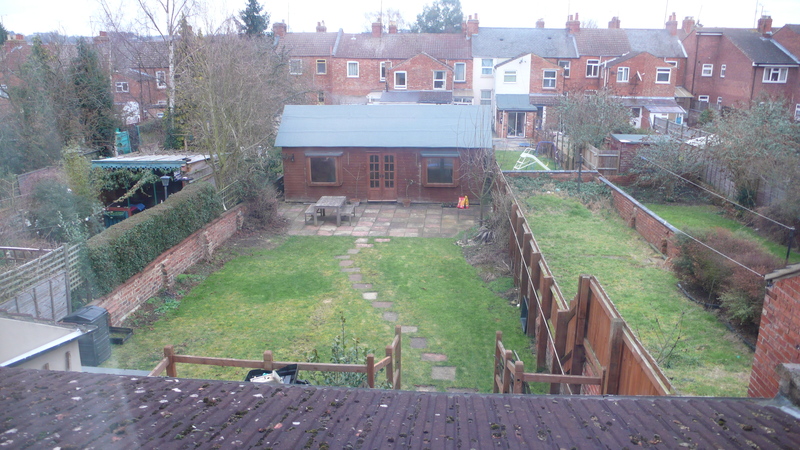 In the house that Karin and I moved into about 18 months ago, the garden was almost wholly laid to lawn; the picture at the top shows you what it was like in early 2012. Since then we’ve dug flower borders, a vegetable patch and planted fruit trees, but kept about 50% lawn (though this will reduce as we widen borders). We don’t water or fertilise the lawn, just keep it regularly mown. I’ve not assessed it systematically but I’d estimate that, in addition to the grasses (some native, some not) there’s another 10 to 15 native plants growing in it, plus fungi which pop up every now and then. The plants include taxa which are popular nectar sources for bumble bees and solitary bees, e.g. clovers, dandelions, etc. These flower even though we mow regularly, and of course these bees pollinate our squashes, courgettes, apples, plums, etc. The local blackbirds and starlings also find food on the lawn. I mentioned that the lawn is “productive” and that’s where the grass cuttings come in. They are either put into the compost heap, fed to our chickens, or added directly to the vegetable patch as a mulch. It’s also possible that the clover, which is a nitrogen fixing legume, is adding to the soil fertility that can be accessed by the far-reaching roots of the fruit trees. Would be an interesting hypothesis to test. So I think it’s possible to have a lawn that adds to local biodiversity and is productive for the gardener, but I accept that we may be unusual in that regard. It’s not the kind of lawn that would make a grass obsessive proud; but that type, as Terry notes, needs a lot of input of resources, not least time. 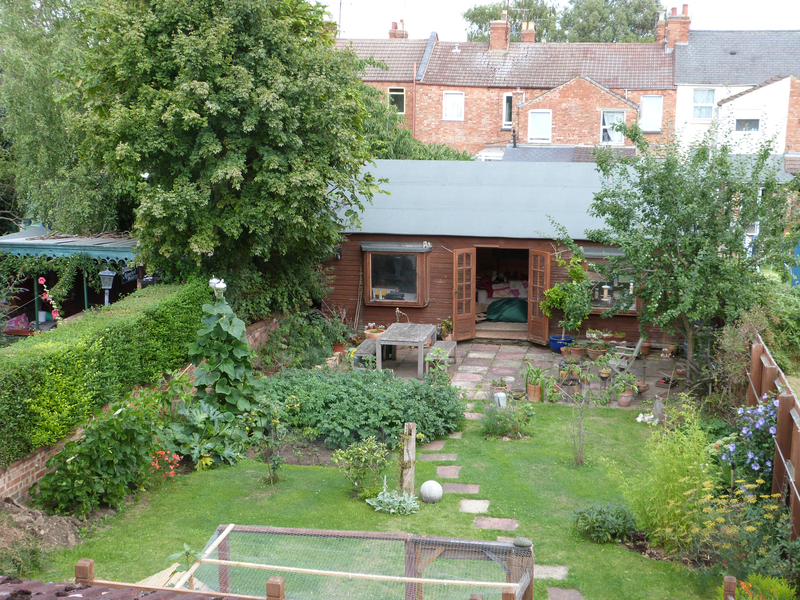 UPDATE – a few people have asked to see a picture of how the garden looks now, so below is more or less the same shot but taken today (15th August 2013) by Karin. Comparing a British garden in February and August is clearly unfair! But hopefully you can see that we’ve done quite a bit of work to it, though as with all gardens it’s a work in progress.